DLSU Admission Test Results AY 2014-15 Released - Balita Boss! 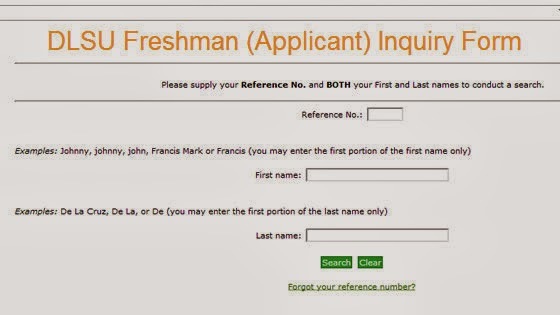 The De La Salle University (DLSU) Freshman Admission Test results are already available online. The La Salle admission test results for Academic Year 2014-2015 was released on Friday, January 17, 2014 through the official website of the DLSU, http://enroll.dlsu.edu.ph/dlsu/freshmen/. Students who took the admission test can check the results through DLSU Freshman (Applicant) Inquiry Form. Just enter your Reference No. and BOTH your First and Last names in the field provided. Click the submit button and the results of the inquiry will be displayed. If it happens that you forgot your reference number, click the “Forget your reference number?” link. Then, enter in the space provided the email address you indicated in your DLSU online application form. The De La Salle University Freshman Admission Text results are also posted at the Henry Sy Sr. Hall Building at DLSU.